Skylanders has surpassed $500 millon in U.S. alone. - This Is My Joystick! Skylanders has surpassed $500 millon in U.S. alone. Half a billion from two releases is a great feat for any franchise, let alone one that was met with scepticism We here at TIMJ celebrate the fact that Activision finally has a major success aside from Call of Duty and World of Warcraft. 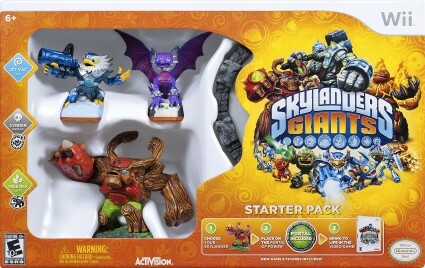 Surprisingly, Skylanders Giants brought in $195 million of that sum in just 3 months. It’s no surprise most of the revenue comes from the accessories, which have beaten both WWE and Star Wars action figures to claim the number one spot in the market, effectively dominating both mediums. Let’s hope another ‘Pocket Monster’ franchise take note. I believe however, that a contributing factor to this success is due to the cross-platform compatibility. Gamers are no longer restricted to a handful of friends with the same system. They are able to carry over their personal achievements with anyone they choose to, whether they own the same system or not. Have you or someone you know hopped on the Skylanders train? Give us your opinion below!